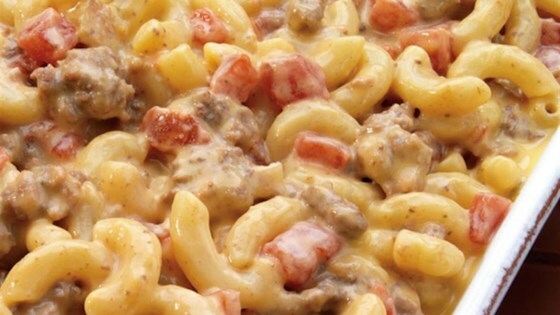 "Even the pickiest of eaters will love this cheesy-beefy dish. Quick and nutritious; recipes just don't get much better than this! Perfect after a long day, it only takes 25 minutes to have dinner on the table." In a large skillet, brown the ground beef and onion. Drain well. Add tomatoes and water; bring to a boil. Add macaroni and bring back to a boil. Reduce the heat to simmer and cook for 10 minutes or until macaroni is done. Sprinkle cheese on top and stir until cheese is melted. A quick and easy recipe for a creamy comfort dish. I added a can of cream of mushroom and some salt, pepper and garlic. It was pretty good. Quick and super easy to prepare. Reminds me of a dish my mom served when I was a kid, so it was nostalgic as well. Loved this recipe just the way it is. Enjoyed how fast it came together and will make it again. Fast and easy! This was a great weeknight dinner that the kids loved.